and understanding the world from the horse’s point of view. Russell is a Licensed 4 Star Senior Parelli Instructor and Horse Development Specialist. He lives near Hamilton, New Zealand with 3 Star Parelli Instructor Ruth Carlyle and their herd of equine partners: Oscar (Selle francais), Maverick (Andalusian), Cassidy (Lusitano) and Maxwell & Denis (Holsteiner x TB). He teaches one to five day camps and clinics for all levels one to four throughout NZ, Australia, the UK, South Africa and Dubai. Not long after his ‘Parelli discovery’ in 1998 while studying Equine Management at Waikato Polytechnic, Russell was offered the opportunity to study with the Parelli’s for 18 months as one of Pat’s handpicked apprentices. In 2000 Russell returned to NZ as a Parelli Professional. Since then he has established himself as one of the longest serving instructors and has taught at all of the international Parelli centers and has taught in 13 different countries. Founded in 1981 by lifelong horseman, horse trainer, rodeo rider, cowboy and teacher Pat Parelli – who was joined by his wife Linda Parelli in 1993 – the Parelli Program focuses on teaching the human rather than training the horse. Early on, Pat realized that horses already had all the skills they needed to thrive in their world. He discovered that understanding the psychology; personality and nature of horses could become the basis for a deep, seamless and mutually beneficial human-horse relationship. Pat named his new relationship-based approach “Natural Horsemanship” which is now recognized worldwide as an innovative and effective method of natural horse training. The Parelli approach is not to train horses, but to teach each horse owner to become his or her own horse trainer, and to succeed by building a relationship of trust with each horse. Of course, horsemanship skills are taught in the Parelli program, but the foundation of the method is built on the relationship as primary, with the principles of Love, Language and Leadership as guides. “People realize this is what they’ve been looking for in all their relationships,” comments Pat Parelli. “It’s balanced with love, language and leadership in equal doses. “It’s about more than just the horse,” echoes Linda. “It really dips into the personal development side of things. You learn about yourself, you learn about communication, about leadership, about truthfulness, about consequence and responsibility. Horse owners who follow the Parelli program have found that not only does the program enable them to become a gifted horse trainer, and not only do they achieve exciting horsemanship successes, but they come away with the lasting gift of an enhanced relationship and communication with their horse. Perhaps the greatest gift of all, however, is that they discover enhanced relationships and communication with everyone in their lives. Pat and Linda’s individual life stories are enlightening and extraordinary, and their love of and dedication to horses is palpable, but it is their common vision and mission for Parelli Natural Horsemanship that truly inspires. So much more than horse trainers, Pat and Linda have dedicated their lives and Parelli International to making the world a better place for horses and humans. Our aim is to make the pathway to Level 1 is about safety and communication, and it focuses on developing a language and earning respect with your horse on the ground. Playing the Parelli Seven Games with your horse On Line – the first of the Four Savvys, or areas of study – teaches you how to read horses and build strong relationships based on love, language, and leadership. Level 2 is about confidence and fun, and will introduce the second Savvy – FreeStyle riding. You’ll learn how riding without contact helps horses become more responsible, self-controlled, and relaxed, and you’ll take your On Line skills to another level of understanding. You’ll be surprised at how much fun you’ll be having playing on the ground. The first two Levels are offered together because we don’t want you to get trapped in Level 1. It’s easy to get caught up in the details when you’re first starting, but we want to make sure you keep moving forward…otherwise you’ll end up boring your horse, and yourself. Level 3 is about skill and excellence. It delves into more advanced On Line and FreeStyle concepts, and then introduces Liberty – the ultimate test of trust and bond. When you play with your horse on the ground without a halter or lead rope, the only thing left is the truth. The relationship, savvy and refinement you’ll learn in Level 3 will take you to a level of excellence that most people only dream about. Level 4 is about the fundamentals of performance – developing all Four Savvys to a spectacular expression of expertise. The fourth Savvy is Finesse – the art of riding with contact and collection – and it is one of the hardest things to do well with horses. Learning to prepare your horse with a solid foundation of all Four Savvys will help you achieve high levels of performance without sacrificing the relationship you’ve built with your horse. 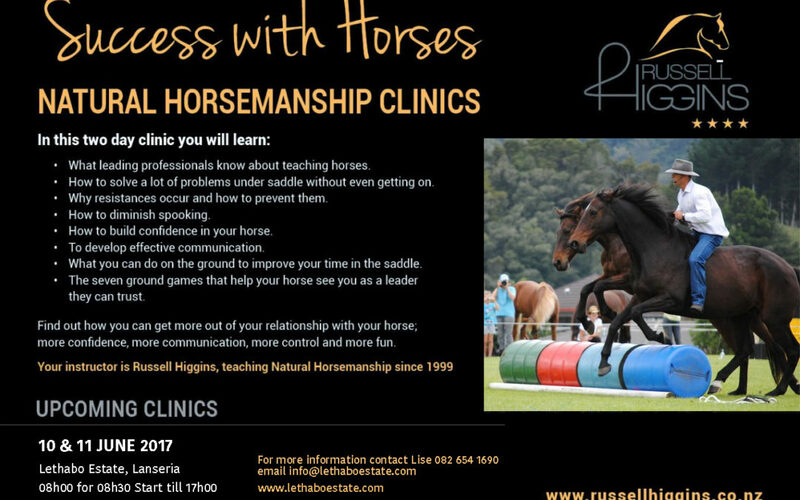 This clinic focuses on ground skills, a good place to start, but also includes time in the saddle building on the ground skills to develop control and confidence in the saddle. * What leading professionals know about teaching horses. * How to solve a lot of problems under saddle without even getting on. * Why resistances occur and how to prevent them. * How to diminish spooking. * The seven ground games that helps your horse see you as a leader they can trust. Find out how you can get more out of your relationship with your horse; more confidence, more communication, more control and more fun. Accommodation & Stabling available, please enquire. 50% Deposit secures you space on course. Specials only apply if paid in Full by the specified date. Appropriate comfortable shoes for ground play – you will be on your feet most of the day – not slops please. Please make sure it is Weather appropriate clothing – bring a change of clothes as Russell and Ruth are NOT scared of the rain and if it rains you will get wet. Were can you get Equipment? Parelli equipment can be purchased directly from Parelli. Please go to the web page wwww.parelli.com click on the shop and you can get the prices from there. They will ship to South Africa you just need to send them an email with the items you would like and request a shipping quote. Please note: on top of the price of equipment & Shipping you will be charged Duty (up to 30%) and VAT (14%) when it lands in the country. This you will have to pay before the parcel is released. Natal Saddlery (Hillcrest, Durban) stock original Parelli equipment – Stocks are limited. Bridget Hampton 082 778 7915 bridgethamp@yahoo.com stocks carrot sticks & makes very nice equipment in JHB (Made from high quality yachting rope) Colours are limited to stock available. Generic Carrot Stick from available from Natal Saddlery (Hillcrest, Durban) & Alison’s (Pietermaritzburg) – Do not purchase the Short Sticks these are for children. Guardians to Sign if under the age of 18.